St Elizabeth’s Primary School were the first school to test out our exciting new Bouldering Climbing Wall. 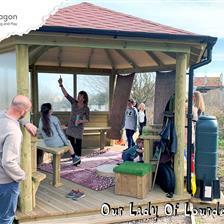 The school always had a high number of children outside during break times and they needed to give them something new and stimulating to keep them engaged. They met with our outdoor learning consultant, Greg Rossiter, to discuss the possibility of installing a climbing wall in an area of the playground that had plenty of open space. We thought the freestanding zigzag design of our Bouldering Climbing Wall would be ideal because it allows for challenging climbs on both sides, meaning a high number of children can enjoy climbing across the wall simultaneously at any given time. The wall caters for mixed abilities and can be approached as singular panel climbs to get to the top, or as a horizontal route around the entire wall. To keep children engaged, the wall contains a difficult overhang challenge, that will test their ability further. You can take a closer look at our Bouldering Climbing Wall here. Now the children have a fantastic climbing resource to truly test their core stability and improve their upper/lower body strength and hand strength. They will also improve their cardiovascular health and muscle stamina. Climbing walls are also known to develop physical flexibility, enhance concentration levels and help maintain a healthy weight. We highlight the importance of tackling childhood obesity here. Furthermore, teachers can use the climbing wall to introduce new playground activities that incorporate areas of learning and topics within the curriculum. It was fantastic to work with St Elizabeth’s Primary School on this project and we can see from the photos and video, that the children are loving their new climbing wall. 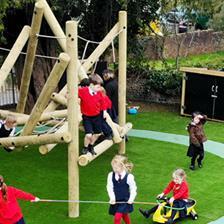 Are you looking for an exciting new climbing challenge for your school playground? 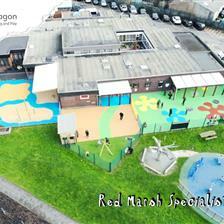 Fill out our Contact Form and we will be in touch to arrange a free consultation with your school.